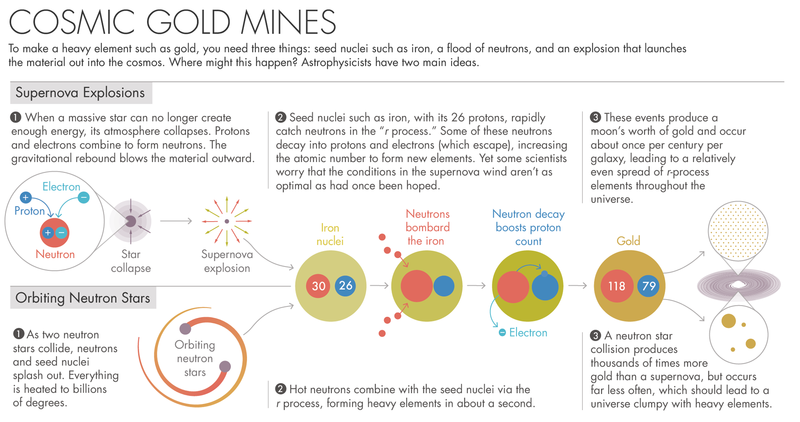 For decades, researchers believed that violent supernovas forged gold and other heavy elements. But many now argue for a different cosmic quarry. Across history and folklore, the question of where Earth’s gold came from — and maybe how to get more of it — has invited fantastical explanation. The Inca believed gold fell from the sky as either the tears or the sweat of the sun god Inti. Aristotle held that gold was hardened water, transformed when the sun’s rays penetrated deep underground. Isaac Newton transcribed a recipe for making it with a philosopher’s stone. Rumpelstiltskin, of course, could spin it from straw. Modern astrophysicists have their own story. The coda, at least, is relatively clear: About four billion years ago, during a period called the “late veneer,” meteorites flecked with small amounts of precious metals — gold included — hammered the nascent Earth. But the more fundamental question of where gold was forged in the cosmos is still contentious. For decades, the prevailing account has been that supernova explosions make gold, along with dozens of other heavy elements on the bottom few rows of the periodic table. But as computer models of supernovas have improved, they suggest that most of these explosions do just about as well at making gold as history’s alchemists. Perhaps a new kind of event — one that has traditionally been difficult, if not impossible, to study — is responsible. In the past few years, a debate has erupted. Many astronomers now believe that the space-quaking merger of two neutron stars can forge the universe’s supply of heavy elements. Others hold that even if garden-variety supernovas can’t do the trick, more exotic examples might still be able to. To settle the argument, astrophysicists are searching for clues everywhere, from alchemical computer simulations to gamma-ray telescopes to the manganese crust of the deep ocean. And the race is on to make an observation that would seal the deal — catching one of the cosmos’s rarest mints with its assembly line still running. In 1957, the physicists Margaret and Geoffrey Burbidge, William Fowler and Fred Hoyle laid out a set of recipes for how the lives and deaths of stars could fill in almost every slot in the periodic table. 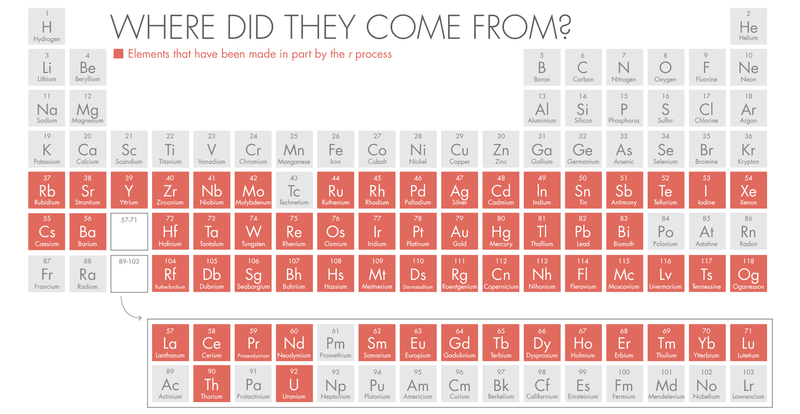 That implied that humans, or at least the elements making up our bodies, were once stardust. So was gold — somehow. “The problem itself is rather old, and now for a long time has been the last stardust secret,” said Anna Frebel, an astronomer at the Massachusetts Institute of Technology. The Big Bang left behind hydrogen, helium and lithium. Stars then fused these elements into progressively heavier elements. But the process stops at iron, which is among the most stable elements. Nuclei bigger than iron are so positively charged, and so difficult to bring together, that fusion no longer returns more energy than you have to put in. To make heavy elements more reliably, you can bombard iron nuclei with charge-free neutrons. The new neutrons often make the nucleus unstable. In this case, a neutron will decay into a proton (popping out both an electron and an antineutrino). The net increase of a proton leads to a new, heavier element. When additional neutrons are thrown into a nucleus more slowly than it can decay, the process is called slow neutron capture, or the s process. This makes elements such as strontium, barium and lead. But when neutrons land on a nucleus faster than they decay, rapid neutron capture — the r process — occurs, beefing up nuclei to form heavy elements including uranium and gold. In order to coax out the r-process elements, the Burbidges and their colleagues recognized, you would need a few things. First, you have to have a relatively pure, unadulterated source of neutrons. You also need heavy “seed” nuclei (such as iron) to capture those neutrons. You need to bring them together in a hot, dense (but not too dense) environment. And you want all this to happen during an explosive event that will scatter the products out into space. To many astronomers, those requirements implicate one specific kind of object: a supernova. A supernova erupts when a massive star, having fused its core into progressively heavier elements, reaches iron. Then fusion stops paying off, and the star’s atmosphere crashes down. A sun’s worth of mass collapses into a sphere only about a dozen kilometers in radius. Then, when the core reaches the density of nuclear matter, it holds firm. Energy rebounds outward, ripping apart the star in a supernova explosion visible from billions of light years away. A supernova seems to tick the necessary boxes. During the star’s collapse, protons and electrons in the core are forced together, making neutrons and converting the core into an infant neutron star. Iron is abundant. So is heat. And the glowing ejecta keep expanding out into space for millennia, dispersing the products. By the 1990s, a specific picture had begun to emerge in computational models. Half a second after the core of a massive star collapses, a gale of neutrinos streams out, continuing for up to a minute. Some of that wind would blow off iron nuclei that could serve as seeds, along with lots and lots of neutrons. “That was the hope,” said Thomas Janka of the Max Planck Institute for Astrophysics in Garching, Germany. “This was, I would say, the most interesting and the most promising site for forming the r-process elements for almost 20 years.” And the explanation still has its adherents. “If you open a textbook, it will tell you that the r process is made by supernova explosions,” said Enrico Ramirez-Ruiz, an astrophysicist at the University of California, Santa Cruz. But as supernova models got more and more sophisticated, the situation got worse, not better. Temperatures in the neutrino-driven wind didn’t seem to be high enough. The wind might also be too slow, allowing seed nuclei to form so abundantly that they wouldn’t find enough neutrons to build up heavy elements all the way up to uranium. And the neutrinos could also convert neutrons back into protons — meaning there might not even be a lot of neutrons to work with. That left theorists circling back to one of the strongest points of the supernova model. Supernovas make neutron stars, which seem indispensable to the process. One way to crack open a neutron star would be to use the same explosion that birthed it. That didn’t seem to work. But what if you came back later, and tore one open again? In 1974, radio astronomers found the first binary neutron star system. With each orbit, the pair were losing energy, implying that one day they would collide. The same year, the astrophysicists James Lattimer and David Schramm modeled what would happen in such a situation — not specifically the clash of two neutron stars, since that was too complicated to calculate at the time, but the similar merger of a neutron star and a black hole. While supernova explosions can briefly outshine the entire galaxies that host them, neutron stars are extremely difficult to see. The supernova that produced the Crab nebula was observed by many different cultures in the year 1054; the neutron star it left behind wasn’t detected until 1968. A merger of two neutron stars would be still more difficult to find and understand. But although nobody had ever seen one, this kind of exotic event could be responsible for the r-process elements, Lattimer and Schramm said. Picture two neutron stars approaching their final embrace. In the last few orbits around each other before glomming together into a bigger neutron star or a black hole, the pair are wracked by enormous gravitational tides. The collision ejects enormous amounts of material. “Kind of like you squeeze a tube of toothpaste, stuff comes flying out the end,” said Brian Metzger, a theoretical astrophysicist at Columbia University. Behind each neutron star stretches a tail, with perhaps 10 neutrons to every proton, all heated to billions of degrees. Heavy nuclei form in about a second. Because they have so many extra neutrons they are unstable, radioactive. They glow, eventually decaying to things like gold and platinum. At least, this is how it works in simulations. Neutron star mergers and supernovas are both capable of making making r-process elements. But there’s a big difference in just how much each of those options can make. 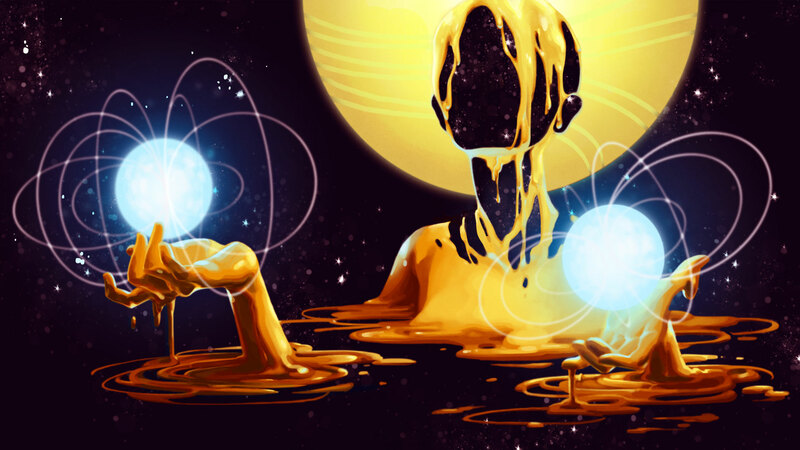 Supernovas produce perhaps our moon’s worth of gold. Neutron star mergers, by contrast, make about a Jupiter-size mass of gold — thousands of times more than in a supernova — but they happen far less frequently. This allows astronomers to search for the distribution of r-process elements as a way to track their origins. One way to assess the distribution and rate of r-process events is to look for their byproducts on Earth. Long after supernovas light up the Milky Way, the nuclei they make can coalesce onto interstellar dust grains, slip past the solar and terrestrial magnetic fields, and fall to Earth, where they should be preserved in the deep ocean. A 2016 paper in Nature that looked at radioactive iron-60 in the deep-sea crust found traces of multiple nearby supernovas in the past 10 million years. Yet those supernovas did not appear to correspond with r-process elements. When the same team looked in deep-sea crust samples for plutonium 244, an unstable r-process product that decays over time, they found very little. “Whatever site is creating these heaviest elements is not a very frequent one in our galaxy,” Metzger said. Not everyone agrees with that conclusion. Another team, led by Shawn Bishop at the Munich Technical University, still hopes to find radioactive plutonium on Earth from recent supernovas. In work now underway, his team is searching for hints of r-process elements in sediments that contain microfossils: the tiny remnants of bacteria that take in metals from their environment to make magnetic crystals. Astronomers can also look for evidence of a chocolate chip-cookie universe farther afield. The r-process element europium has one strong spectral line, allowing astronomers to look for it in the atmospheres of stars. Among the old stars that are found in the halo of the Milky Way, observed r-process signatures have been hit or miss. “We can find two stars that have very similar, say, iron content,” Ramirez-Ruiz said. “But their europium content, which is the signature for the r process, can change by two orders of magnitude.” Because of this, the universe is looking more chocolate chip than chocolate glaze, argues Ramirez-Ruiz. Astronomers have found an even cleaner example. Many dwarf galaxies experience just one brief burst of activity before settling down. That gives them a narrow window for an r-process event to occur — or not. And up until 2016, not one star in any dwarf galaxy seemed to be enriched in r-process elements. That’s what made the phone call MIT’s Frebel received one night so surprising. Her graduate student Alex Ji had been observing stars in a dwarf galaxy called Reticulum II. “He called me at two in the morning and said ‘Anna, I think there’s a problem with the spectrograph.’” One star in particular appeared to have a strong europium line. “I made this joke. I said, ‘Well, Alex, maybe you found an r-process galaxy,’” Frebel said. He actually had, though. Reticulum II has seven stars enriched in the r-process elements, all implicating a single, otherwise uncommon event. To advocates of the neutron star merger model, all of this fits nicely. Neutron star mergers are naturally rare. Unlike a single massive star collapsing and going supernova, they require two neutron stars to form, to be in a binary orbit, and to merge perhaps a hundred million years later. But critics also point out that they might be too rare. In our galaxy, neutron star mergers could happen as rarely as once every hundred million years, or as often as once every 10 thousand years — rates that differ by a factor of 10,000. “The thing that shook me is: The people who were saying neutron star mergers are going to explain the r process were also taking this highest rate,” said Christopher Fryer, an astrophysicist at Los Alamos National Laboratory. When Fryer and colleagues used more moderate guesses about how often neutron star mergers occur and how much r-process material they yield, they found that neutron star mergers can explain only 1 percent of the r-process elements observed in the universe. And if the true rate lies at the lowest end, they could contribute a hundred times less again. 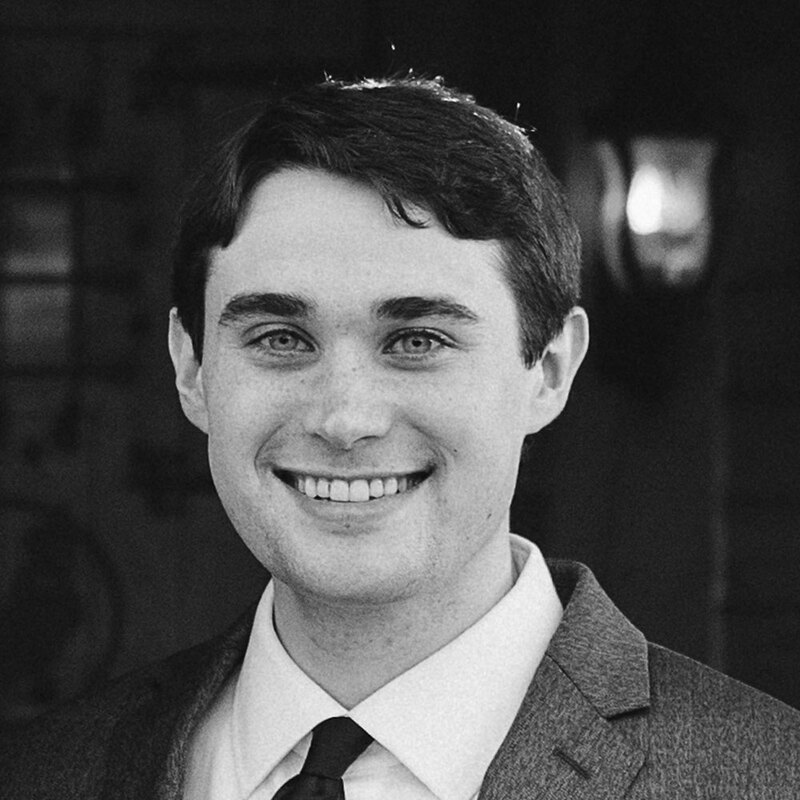 “More people are going back to ‘Huh, what other sources of r process can we have?’” Fryer said. The answer, many astronomers believe, will end up being some kind of compromise. That shift may already be happening. “R process is really not r process anymore now,” Frebel said. Maybe it can be broken in half, with the “weak” r-process elements lighter than barium coming from supernovas, and the heavier ones like gold coming from neutron star collisions. That data may already be on its way. The last few orbits of a neutron star merger or a merger between a neutron star and a black hole warp and drag space-time so much that gravitational waves roar out of the system. LIGO (the Laser Interferometer Gravitational-Wave Observatory), which has already succeeded at “hearing” such a crescendo between merging black holes, is approaching a sensitivity that should let it start picking up neutron star mergers in distant galaxies. The longer it doesn’t, the less often it seems these events occur. Once LIGO reaches its full design sensitivity, a nondetection could spell doom for neutron star merger models. “If they still have not found something, there will be a moment in which Enrico [Ramirez-Ruiz] and Brian [Metzger], etcetera, should wonder, and get back to the board,” said Selma de Mink, an astrophysicist at the University of Amsterdam. The dream, though, is to go beyond making inferences about r-process events and see one actually in action. Two teams may have already done so. In 2013, the Swift satellite picked up a short gamma-ray burst: a type of event also attributed to colliding neutron stars. Other telescopes zoomed in on the aftermath. In simulations, an observational signature called a kilonova follows neutron-star mergers. The radioactive nuclei made through the r process spread and glow, causing the system to ramp up in brightness for about a week before starting to fade. And these elements are so opaque that only red light can penetrate out. The 2013 event matched both predictions, but it was so far away that it was hard to fully interpret. “It’s not compelling but it’s suggestive,” Metzger said.